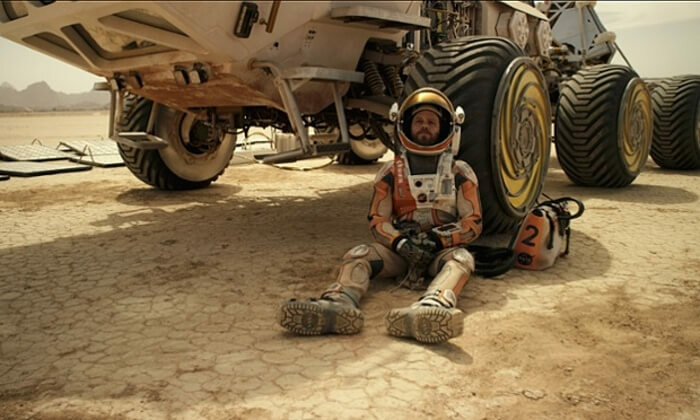 Home » The Martian and Nasa – a coincidence too good to be true? It could hardly have come at a more spookily appropriate time: just when film-fans and the media are getting excited about the entertaining new sci-fi movie The Martian, about a troubled Nasa mission to Mars, released this week in the UK and the US. Matt Damon’s lovely chops in his space-helmet are all over the airwaves and the billboards, promoting a film with which Nasa has cooperated, with generous use of their branding. And now Nasa itself has chosen this moment to get us all excited about some news about the red planet. They’ve offered an answer to David Bowie’s famous question about whether there is life on Mars. Well … yes! Or rather … not exactly! But there is water. Water that could sustain life! Possibly! Nasa has now revealed that there is evidence of stain-marks on Mars’s canyons and crater-walls: water is trickling downhill before drying up in the valleys and plains. The water flows could lead Nasa or another country’s space agency to potential sites where life on Mars could be found. Exciting stuff. You would have to be a very dull and earthbound sort of person not to be intrigued by this. But as our science editor Ian Sample points out, discovering residual evidence of water on Mars is not exactly new. Pictures beamed back to Earth way back in the 1970s showed evidence of dried-up rivers once submerged beneath ancient lakes and Nasa’s probes are always discovering circumstantial evidence of water on Mars. Ten years ago, its Mars Global Surveyor probe sent back pictures of what may have been water bursting through a gully, and four years ago Nasa’s Mars Reconnaissance Orbiter camera captured images of what appeared to be streams flowing down crater walls. Of course, perhaps only a cynic would say that Nasa has to keep alive in all our hearts the romance and glory of space travel to stay in tax-funded existence, and so the possibility of water on Mars is an article of faith. And if there is an entertaining movie about a Nasa mission to Mars, which at certain points is almost a feature-length ad for Nasa … well why not time your latest announcement to coincide with its release? To coin a phrase: it isn’t rocket science. When I heard about the news from Nasa, I put on my DVD edition of Stanley Kubrick’s 2001: A Space Odyssey which, among its extra features, includes a film of the promotional speech given at the time by Arthur C Clarke, who wrote the story on which the film was based. To uproarious laughter from his audience, Clarke revealed that the Apollo management committee had rescheduled an official meeting so that they could get to the premiere. Oh my God! Just as 2001: A Space Odyssey was coming out … space aliens were trying to make contact! With beeping radio signals! Weren’t they? It must have been huge news at the time. It must have boosted ticket sales for 2001. Why has this mind blowing event been forgotten? Perhaps, after all the excitement died down, scientists did indeed discover a “natural explanation” of the sort Clarke warily acknowledged, and everyone dropped the matter. Well, never mind. If Nasa scientists and film-makers and their respective PR teams can find a common interest, why not? Cinema flourishes, and who knows? Maybe there is water on Mars – and much else besides.